In order to satisfy the common need for public transport in Bucharest city, there were foreseen since the 1970’s major surface routes with a view to take over the passengers’ flows, but these ones did not offer adequate solutions and comfortable conditions. Consequently, the introduction of a metro transport system was needed, as the best solution not only for surface traffic clearance, but also for the passengers transportation in comfortable, safe conditions and enhanced speed. Further the preliminary studies prepared during the 1972 - 1975, the simultaneous design and construction of the metro has begun. February 15th, 1972 -a commission was set up in order to issue specific proposals regarding the construction of the metro. November 25th, 1974 - the commencement of the foregoing works was decided: studies, designs, analysis. February 1975 - It was established the Bucharest Metro Company (“intreprinderea Metroul Bucuresti”) having the role of building the entire metro transport network. Further this date, the tunnels construction begun and also the trains design. The Metro – as well as any other construction, supposed and suppose, more or less, the prolonged existence of the site and due to less comfortable conditions “offered” to those living in the area of influence or just passing by, the site was not and will never be seen, as a rule, with too much sympathy. The first pole of the site – as contractors say – was hammered on September 20th, 1975. 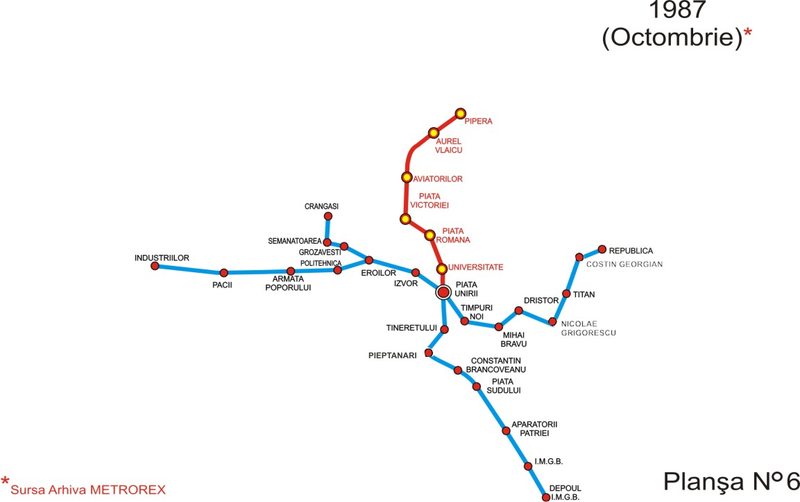 After this event, more than four years of construction site had passed and Bucharest, at that time, had been entering in the category of the first sixty (60) metro networks in the world; it was known, of course, that in 1974 Prague became the 50th city with an operational metro network. The construction rhythm at this first stage was of 2 km per year, it did not mean too much, but for such innovating work in the country, it was a steady rhythm. Shortly after the construction rhythm was doubled, keeping it steady till the works completion of the last line. Hereinafter the metro was executed in a rhythm of 4 km per year, much better than the recorded worldwide average, only the metro in the capital of Mexico recorded a higher rhythm of 5.5 km per year. The metro stations indoor execution with covered moulded walls based on the idea of using the city ling of the station as a supporting element of the moulded walls during the execution period. To this idea, the ceiling of the station was precasted before executing other structural elements, by seating on the ground, on the end of the moulded walls and on the metallic poles launch in tranches bored in depth. The construction of underground tunnels with boring machines concerned the designing engineers during the first days of Bucharest Metro Company (“Intreprinderea Metroul Bucuresti”) existence. This solution could not have been completed until all its elements were created: the feeder and mounting machine for precasted arch keys – tunnel boring machine - arch keys production and so one. They needed to choose a type of shield that could be rapidly manufactured in the country and able to keep the stratification front about to be excavated, since a good portion of it was sandy and many under-crossed public utilities were sensitive to compacting. It had been chosen the half-secured boring machine, with open front, but driven by horizontals shock stroke breaking the flowing sand. The shields for metro tunnels have been designed by I.P.C.F. based on the design prepared by the Bucharest Metro Company (“Intreprinderea Metroul Bucuresti”) and manufactured at “23 August” Bucharest Plant. In 1977, it was set up “Întreprinderea de Exploatare a Metroului” (I.E.M.B.) subordinated to the Ministry of Transport - Railway Department, and on November 16th, 1979 the first section of metro was commissioned. By Government Decision no 686/1991, I.E.M.B turned into “Intreprinderea de Exploatare a Metroului Bucuresti, Metrorex” under the authority of the Ministry of Transport, having as scope of activity “the passengers transport with metro using the terrestrial and underground railway network, within safety traffic conditions, in order to comply with the public, social and civil defence interest.” Additionally, the Government Decision no.266/1993 confirmed the “environmental and strategic specific monopole” of the metro. Based upon the Decision no. 482/24.06.1999, published in the Official Journal of Romania no. 293/1999 the name of the company changed into “Societatea Comerciala de Transport cu Metroul Bucuresti METROREX S.A.”. The infrastructure and technological installation operation, maintenance and repair is performed by the existing personnel, distributed in main sub-units, as follows: electro-energetic, electro-mechanical, automatic lines block signalling installation, automation and telecommunications, lines-tunnels, special constructions, metro stations administration and maintenance, traffic control, commercial, depots. The metro transport system is continuously monitored and coordinated by a Central Traffic Control, which subordinates some other five branch dispatching centres. The Bucharest metro has already a major configuration that places it among the most modern and efficient means of urban transport. Its construction still continues, this ongoing activity confirms once more the acute need of a metro network in Bucharest. On November 19th, 1979, form Ciurel Depot, the first metro train set off to Semanatoarea station in order to get on board its first metro passengers. Until December 19th, 1979 when the official grand opening took place, the metro operated with passengers on board, being the only metro that during the burn-in period run with passengers. In December 1984, it was commissioned the section between Semanatoarea and Crangasi (one station). On this occasion, it was created the link between Giulesti district area – the Bucharest downtown – “23 August” industrial platform – Militari industrial platform (Industriilor). During this period, intense works for construction of Line II were made; the line was intended to create a connection on the North-South direction of Bucharest. On this occasion, the third large industrial area (IMGB) was linked to the capital downtown. Consequently, the passengers using the metro could travel from downtown (Piata Unirii) until “23 August” industrial platform or IMGB industrial platform or Militari industrial platform (Industriilor) or until Giulesti district (Crangasi). This section should have been commissioned with passengers a few months earlier, but compared with the initial forecast, some delays were registered. In December 1987, additional to Crangasi, another station was commissioned, Gara de Nord , connecting the industrial areas with Gara de Nord Railway Station. On this occasion, the metro ring incorporating the capital downtown was being closed. - Pieptanari became Eroii Revolutiei. In May 1991, it was commissioned Antilopa metro station and the segment between Republica and Antilopa. At the end of 1992, it was commissioned Basarab 1 station, built between Crangasi and Gara de Nord stations. This station will subsequently incorporate Basarab 2 station that will serve Line IV. Here, the platform is common for passengers, but with different tracks that serve the two lines: Line I and IV. Since the distance between Armata Poporului (“Lujerului”) station and Pacii station was of about 2.5 km and in Militari district, especially Piata Gorjului area (very crowded area) was located right in the middle of this distance, after 1990, it was decided the construction of a new metro station at Piata Gorjului. The works were troublesome, especially because the trains had to be in service on this route. Under these circumstances, it was decided the station to be built and, at the beginning, only half of it to be commissioned. Therefore, this station had been opened in two stages, in 1994 and 1998. In 1994, it was commissioned the first half of the station that marked the running direction from Armata Poporului (“Lujerului”) to Pacii and, in 1998 the other half of the station became operational. - Linia de Centura (currently “Anghel Saligny”).